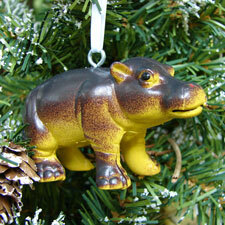 The Chubby Hippo Ornament is a little sensitive about his appearance so please say only nice things around him. He's got a brownish upper body with yellow underneath and the cutest little face ever. And he's stocky, not fat. Made of sturdy rubber, our guy is hollow inside and measures almost 3" long.